We all love to decorate, celebrated and have fun during the holidays and Christmas. Especially, Moms and dads are so busy with Christmas décor, greetings, Christmas gifts and of course the Christmas dress. These days kid’s style is always at the top priority list for them to look stylish and trendy on Christmas Eve. Blacks and suits are always the best options for any party wear dress, but let’s not keep our holiday dressing so-basic! 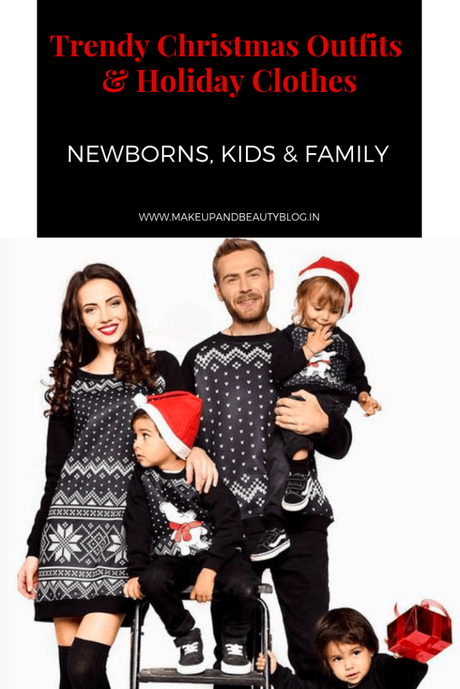 Keeping this in mind, we have gathered some amazing Christmas outfits for Newborns, Kids & Family. Check them out on the Popreal- online clothes shopping apps! 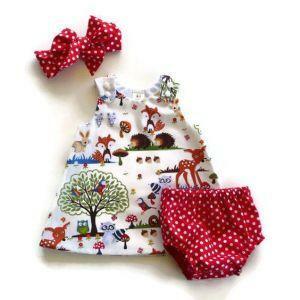 Children’s rompers are a traditional style for baby Christmas outfit. In addition Smock Dress in red or floral looks absolutely adorable. Also, baby Christmas dress in vintage embroidery is sure to make your tiny one stand out on Christmas Eve or any festive period. Don’t forget to team it a Mary-Jane Baby Shoes. Boys Romper in embroidery, Peter Pan collar or with lace details is a super cute way to dress up your little one this Christmas. And those chubby little baby legs are sure to kill all with cuteness. This can also be preferred the best Christmas Day outfit or gift for a baby shower for a little prince. Adore the vintage style as they look regal and stunning for any festive occasion. A stunning red bow, lace details, gorgeous embroidery, and Peter Pan collar can make a timeless classic dress for your little princess. Add a sparkle of rose gold to your little one’s Christmas outfits! This color is so trending this year and looks versatile. Finish off your newborn baby girl clothes look with a cute hair bow. Now that’s icing on the cake, right? Winters are the time to keep our little ones warmer, but yet look stylish. 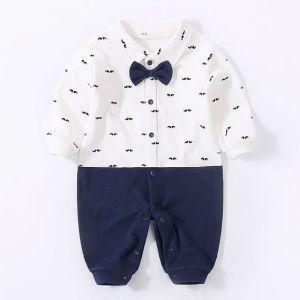 Unisex baby clothing sets is a very cozy option for winters. Pair these with knee high socks or tights, and leather shoes for the perfect festive style. Baby & Toddler Christmas Clothes in Santa fur and cuff pant are so trending. 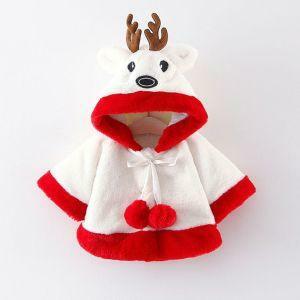 You kid will love to wear this Stylish yet fun Childrens Christmas Outfits. Get inspired from the fashion designers and Kids fashion trends. 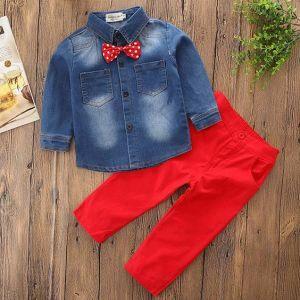 These trendy kid’s clothes have stylish embroideries, fringe, lace, appliqués, bows, and ribbons. Suit ‘em up! Let your toddler look adorable in a formal tailored suit. 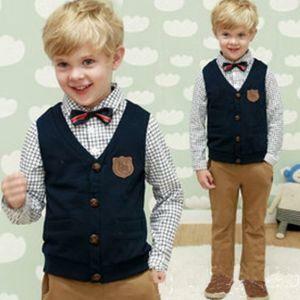 This is the perfect dandy dude Christmas wear for boys for caroling or photoshoots. 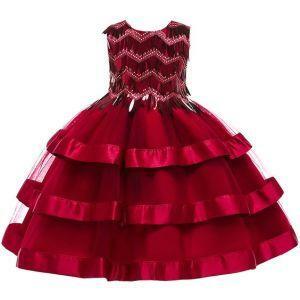 Meanwhile, for girls, a gorgeous taffeta party dress is all you need to dress her perfectly for Christmas party. 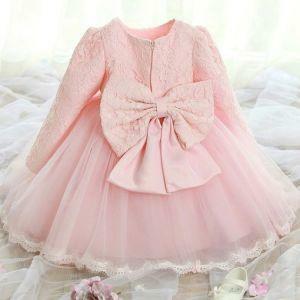 This holiday make your little girl wear a sparkly dress and make her feel like a princess. 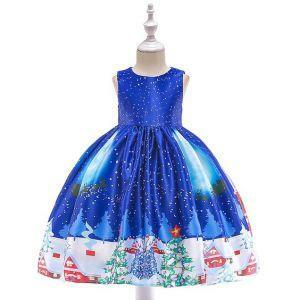 Girls Christmas dress definitely has loads of choices. And bold colours & prints for holiday outfits make it even more interesting and fun to wear. Matching Family Christmas Outfits are so much in trend. You too can join the holiday tradition bandwagon by having your entire family wear the cute matching Christmas clothing sets. 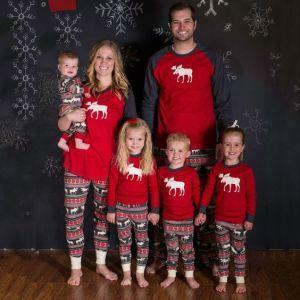 Buy these family matching pajamas in fun prints, plaids or Christmas prints for your whole family, including couples and kids. While even your dogs and cats can match up with the Whole Family Holiday Outfits! Don’t forget to pose for the perfect family picture for the seasonal greeting card.